Do I have to use food to train my dog? Is training a dog with food bribing? Dog Training With Food, Yes or No? You don’t have to use any particular tool to train your dog. Professionals like food because it is one of the most powerful motivators in animal training. The reality is that you get more strongly conditioned behaviour if you do not limit yourself to praise alone. Another advantage of food is that you can use it to target the dog into position. Food, therefore, has two roles: as a target (“lure”) and as a reward. Training with positive reinforcement allows the dog to relax and learn and strengthens the bond between you and the dog. Over time, you can expect “more for your money”, that is more behaviours for fewer treats. You will also become skillful at incorporating other rewards into training. Aren’t I actually bribing my dog by luring him into position with a treat? You can’t bribe a dog for doing something he doesn’t even yet have in his repertoire! Put yourself in his place. Imagine that someone said “palana”. What would you do? Nothing, because you don’t understand what that person wants you to do let alone why you should do it. Physically placing your dog into position slows down learning and has negative side effects. Using a target allows you to elegantly obtain the correct behaviour. 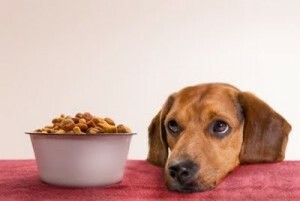 Will I always have to food reward my dog? Certainly not as frequently as for a newer behaviour, but yes, maintenance of established behaviour with (concealed) intermittent rewards is a must. There is no free lunch in behaviour. Think of it this way: you have to feed your dog anyway. You can give it all to him for free in a bowl or you can reserve part of his daily caloric intake and make him earn it! Also, don’t forget that there are other rewards besides food: everyday things such as play, sniffing, walks, door opening, car rides and access to other dogs can also be used to reward established behaviour. 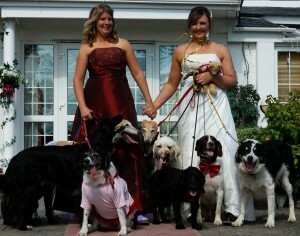 On the 9th Aug 12 Emma Wilcock and Lynsey Reid celebrated their civil partnership, joined by their ever faithful four legged friends. The two tied the knot at The Lavender House Hotel set in Dartmoor and were joined by up to 25 canine friends who were invited to the ceremony, with their owners. Their 3 dogs took part in the ceremony, Quirky and Bruno the Labradors walking the two down the aisle and carrying the rings in pouches round their necks and Oddie the cocker spaniel walking with the bridesmaid, India behind the two. The couple enjoyed a honeymoon in the Lakes District, with their dogs of course! Lynsey and Emma run Sensible Dog which is based in Devon and is a long established canine care business offering doggy daycare and socialization, plus behavioural consultancy as Lynsey is a certified behaviourist. Congratulations to you both from all at The Good Dog Guide.